Manual: This will be a mechanical device, which uses a spring that is displaced when a weight is placed on the scale. They will give you the weight, but then you'll have to calculate how many stamps to affix according to current postage rate. They are typically cheaper than a digital scale. 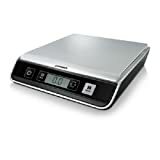 But there are many reasonably-priced digital scales, that the price difference needn't be a consideration. Digital: These will have a LCD display, giving accurate readings within the scale's tolerance. They can also calculate the postage that must be affixed. 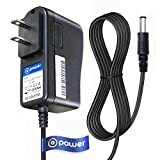 There are digital models that require you to enter the current postage rate, while there are also more advanced models that update the postage rates from the Internet. Easy to read: There are digital scales that have a backlit display, so that the numbers are easier to read. They can also feature a detachable LCD display, that is separate from the platform upon which you weigh the postage. In the event that you’re measuring a large object that obstructs your view of the scale, this allows you to position the display somewhere that is more convenient. 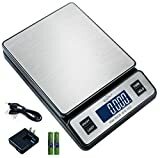 You will probably want a scale that can display the weight in metric or English system units (kilograms or ounces). Auto-shut off: If your scale uses batteries, a useful feature is having auto-shut off. 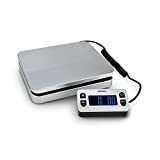 The scale will go into standby when you are not weighing anything for a while. Hold button: People were pleased with the Accuteck A-ST85C’s hold button. This allows you to weigh an object, and store the measurement, even after you remove the package. Capacity--This is the maximum weight that the scale can hold. Some can hold up to as much as 400 pounds. Sensitivity--This is the accuracy of the scale. 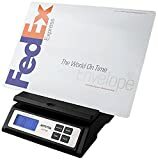 You clearly want your scale to give accurate measurements, since it can determine whether your postage arrives or not. It should be noticed that scales are typically more accurate if they weigh lighter objects. 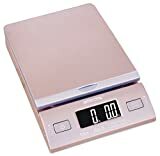 Some scales are accurate to 0.05 pounds (0,11 grams). Letter & envelope holder/mailing tube holder: If you want to weigh large envelopes, or a tube, you might find it hard to place these types of objects on the scale. There are some scales that have a special holder into which you insert envelopes and tubes. This lends to better accuracy in measuring large objects. Load cell: LW Measurements makes load cells that can also be used to measure weight. A load cell creates an electric signal proportional to the weight being measured.The more load cells that a scale has, the greater will be that scale's accuracy. Their LW Measurements LLC LSS-400 contains 4 load cells, and can weigh up to 400 pounds. Tare weight: Tare weight is the weight of the contents of a package, without weighing the package. 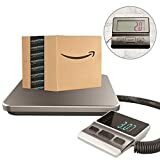 There are scales that allow you to subtract off the weight of the packaging--that uses the Tare Weight feature on the scale. Accuteck--is a maker of a series of postal scales. Their scales have a number of ranges of capacities, from 50 pounds to 440 pounds. Their scales work on battery power or on an AC adapter, and have different levels of accuracy. WeighMax--are makers of a wide range of scales, for different uses: industrial, bathroom, kitchen, postal, pocket, and table top scales. They also make calibration weights and luggage scales. They are located in City of Industry, California. Dymo-- was founded in 1958 as an embossing company, but they have expanded to become manufacturers of products for the office, warehouse, worksite, home, and classroom. They make embossers, labels and label makers, contact management software, business card scanning solutions, mailing and shipping scales, and more. LW Measurements LLC--is located in Rohnert Park, California. The company was founded by Boon Lim in 1991. The company has design patents on a number of their scales, as well as patents on scale measurement software. They are makers of postage scales, kitchen scales, veterinary and medical scales, balances, and more.